I am sitting in Denver International Airport as I compose this, fresh out of a crowded TSA maelstrom, and awaiting my flight home. I came out here several days ago to visit family in the Mile High City. A new backpack had been sitting in my garage and I thought that a travel trip for its maiden voyage would wring out its versatility. 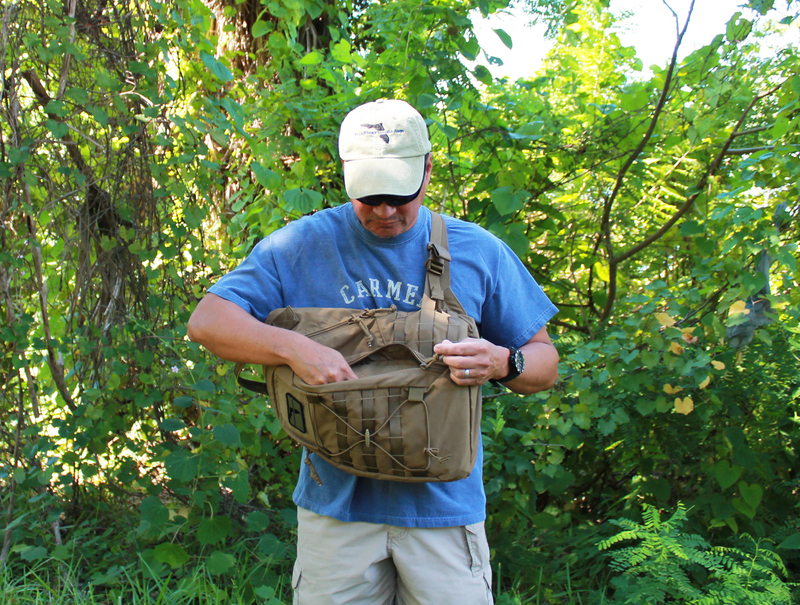 The carrier in question is a new Mil-Spec Monkey/Tactical Tailor Adapt Pack. 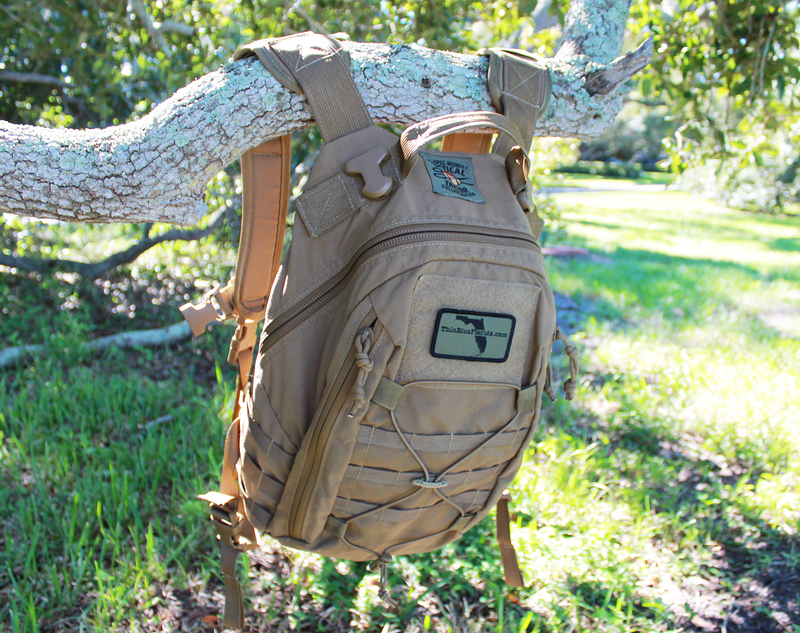 The Monkey contracted with Tactical Tailor to build a lightweight, multifunctional backpack for either military, LE, or hard-use civilian demands. 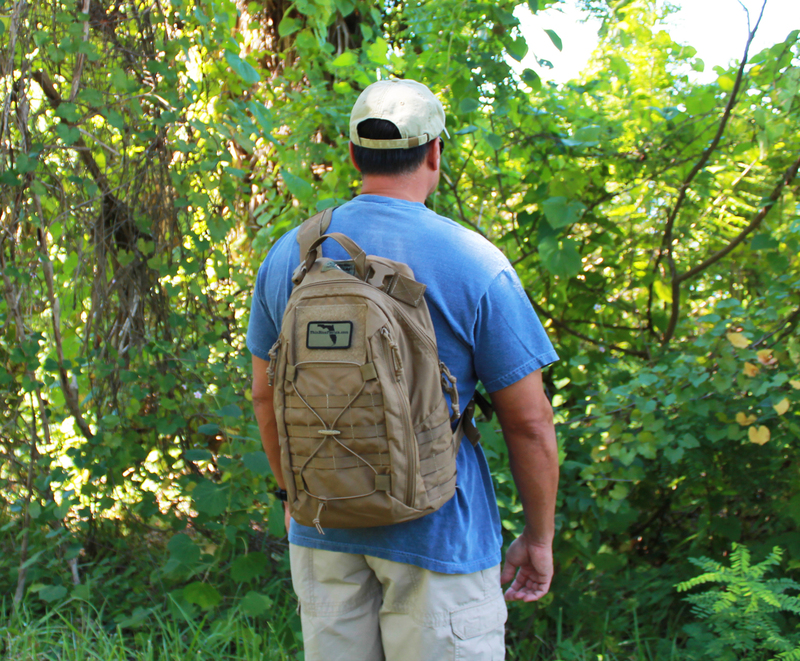 The MSM Adapt Pack can be configured as a traditional two strap backpack, one strap slingbag, or no strap grab-n-go bag. The morphing quality of the pack appeals to the traveler in me, as I have differing requirements for it depending on the day. The Adapt Pack is arranged with a front compartment that is lined with a large interior loop field for attaching hook side Velcro carriers. These can be holsters, sheaths, pouches, admin panels, and the like. Because this pocket has zippers on the right and left sides, the contents are easily accessed. Dimensions for the front compartment are 14″ tall x 8″ wide x 2.5″ deep. Behind the front pouch is the main compartment. It zippers opens along 1/3 of the top. Inside are two bottle/stash pockets on the bottom right and left corners. Tube or wire exits are incorporated on either side of the top panel. Each have a hook and loop closing flap. The main cargo hold is 17″ tall x 9.5″ wide x 5.5″ deep. Finally, the rearmost compartment is a top-loading hydration pouch or utility pocket. It is 17″ tall and will hold a full-length bladder. The closure is a center hook and loop patch that has openings on either side that allow the shoulder straps to be stowed in the pouch. Slit openings at the bottom of the pouch are made for hiding the lower straps and buckles. For the pouch-happy, PALS webbing is sewn on the front and sides of the Adapt Pack. A shock cord adds exterior clothing carry. To shore things up, an adjustable sternum strap clips across the chest and can be raised up to accommodate women’s torsos. For trips to the airport, I used the backpack configuration because I needed to wrangle a checked bag and I would rather the pack not slide off my shoulders. 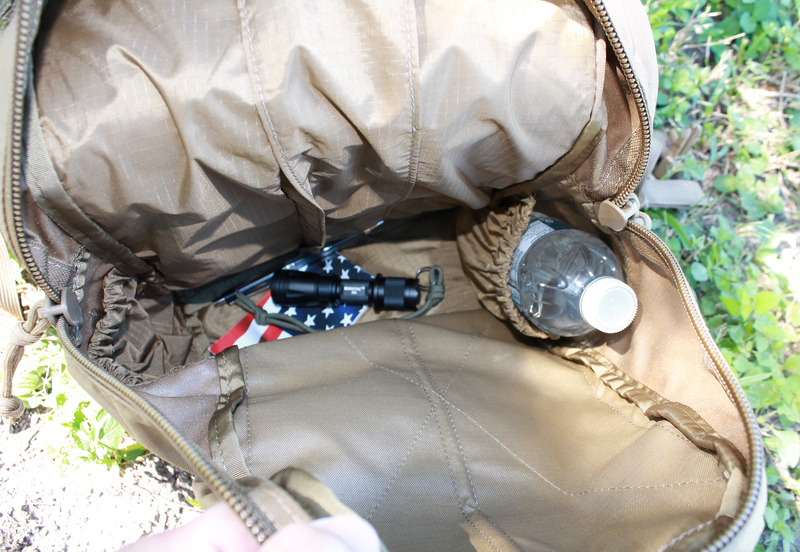 Same strap placement was employed for a short nature/exercise hike with water bottles snug in the provided pockets. Hey, look, prairie dogs! 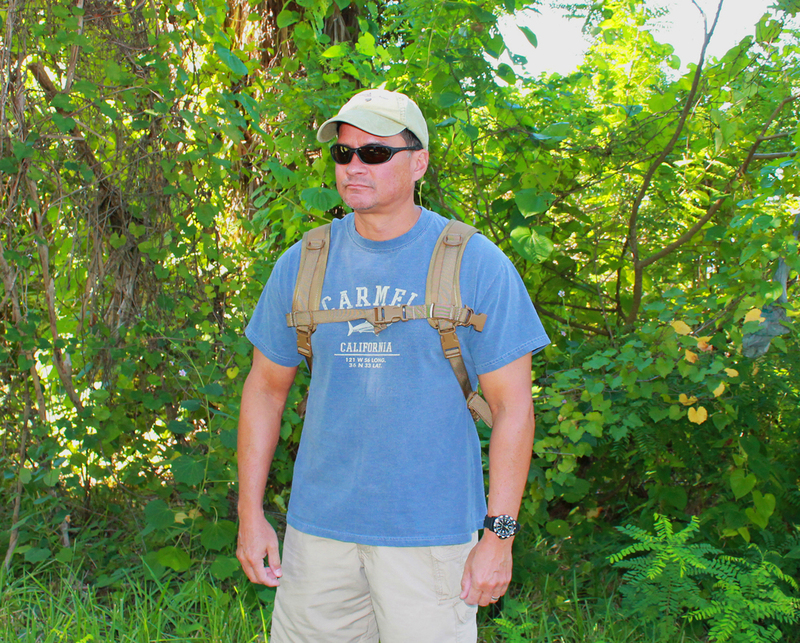 When I forayed out on multiple family missions, I switched the Adapt Pack to slingbag mode with the pack’s strap diagonal from my left shoulder to right waist. I like this casual style of toting goods for EDC. It was easy to unbuckle the straps and reconnect one pair to the opposite side. As a slingbag, the AP can be stabilized with a mid-mounted side strap, although I do not think it necessary. 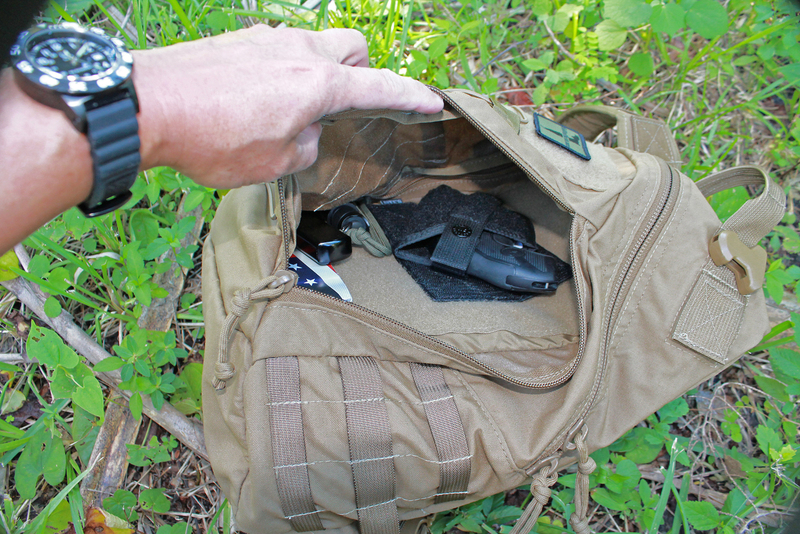 When I have used the Mil-Spec Monkey Adapt Pack for off-the-body carry of a concealed firearm, I place an appropriate hook and loop holster in the front compartment with the pack rigged up as a sling. Left shoulder to right waist strapping makes the bag swivel across my dominant side (right), so I can rotate the bag with either hand and extract the gun with the right hand. 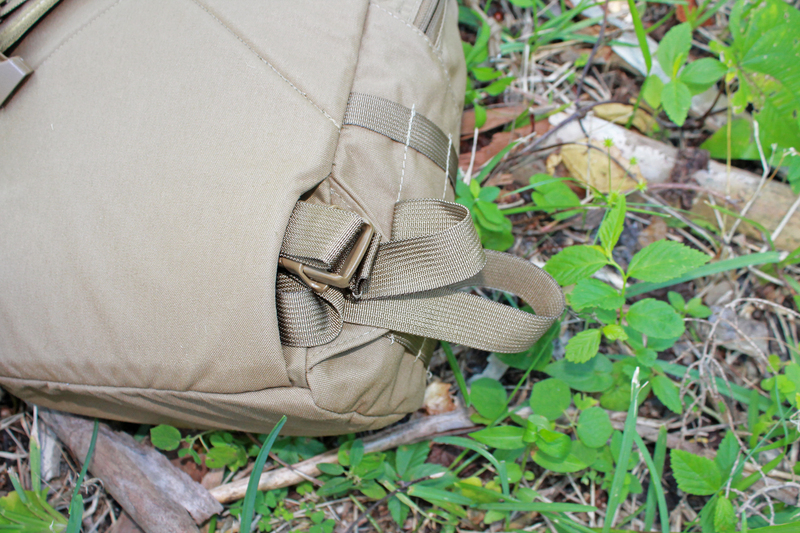 For CCF purposes, I took off the paracord zipper pull on the left side of the front compartment. This allowed access only through my desired side. It felt more secure to have a single way to the gun. After carrying the Adapt Pack this way, I left the paracord off. I found the same sense of security held true if I was only toting a wallet, cell phone, and keys in this front pocket. 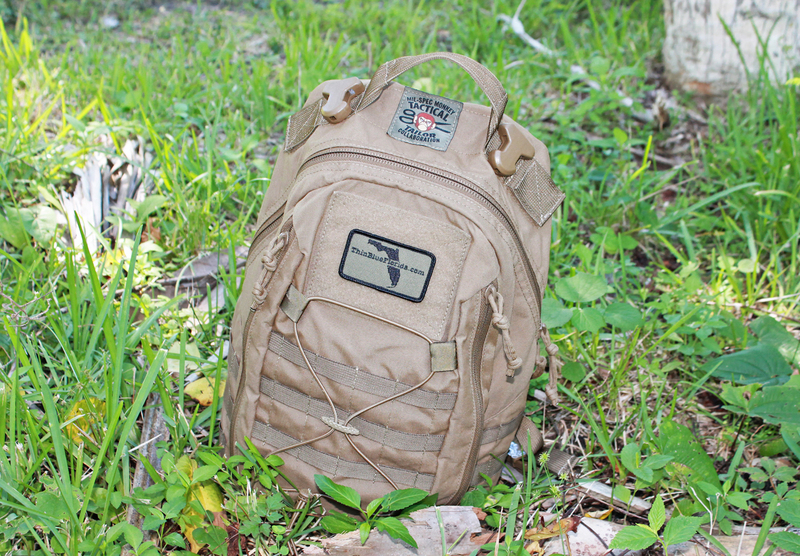 Mil-Spec Monkey wanted this to be a lightweight pack. 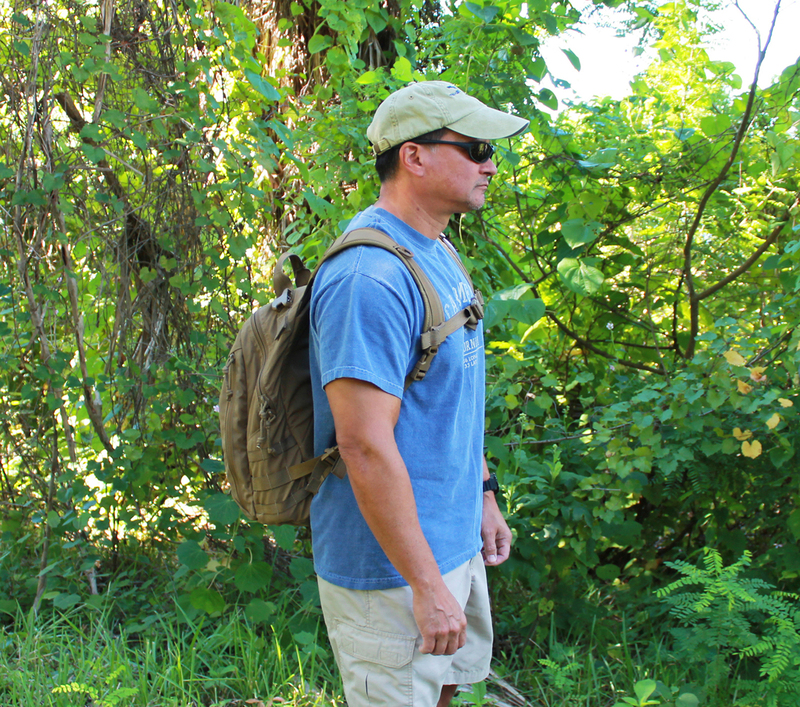 At 1.75 lbs, the Adapt Pack is feathery in overall materials but still extremely durable. Despite the scant amount of nylon and polymer, nearly 1,200 cubic inches of gear can be stashed in an Adapt Pack. Even when heavily loaded, it rides close to the body and comfortably out of the way. 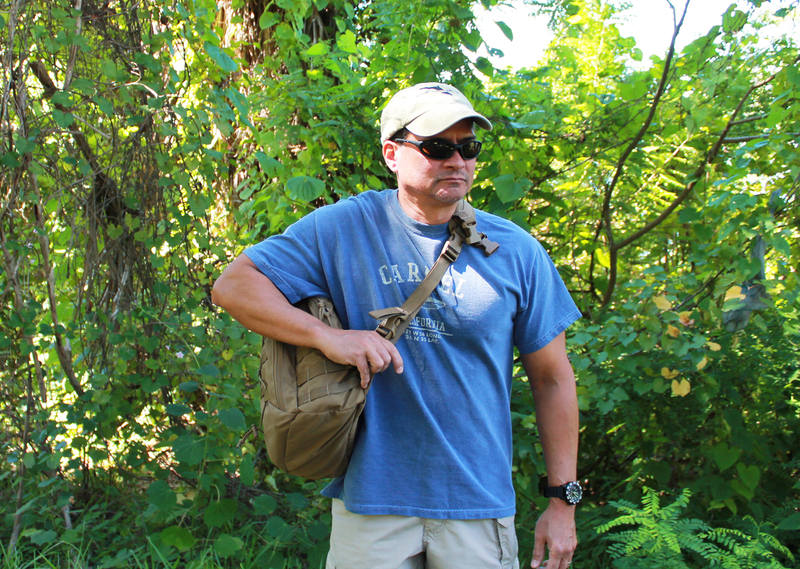 I have been very pleased with my Tactical Tailor Urban Carry backpack. The same quality components and solid manufacturing I found in the Urban Carry pack are present in the MSM Adapt Pack. 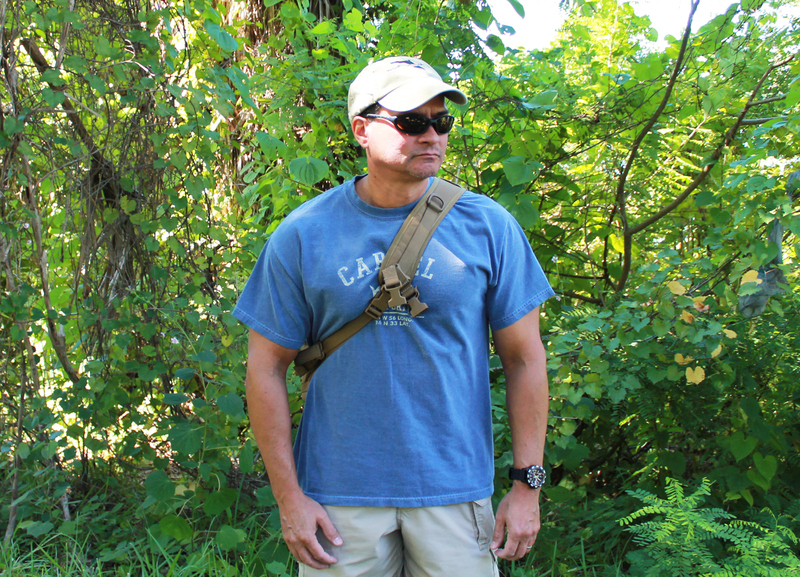 Tactical Tailor makes its products in the USA. 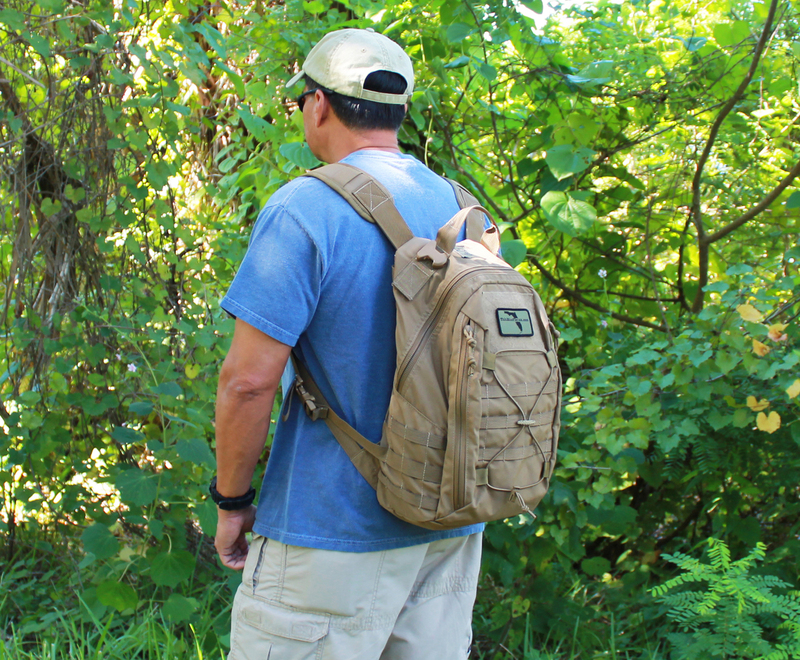 The MSM Adapt Pack comes in Ranger Green, Urban, Black, Marine Coyote, Foliage, and Multicam. MSRP is a smile-generating $99.00. Nice job by MSM to show In Stock quantities for the various colors at their online store, too. I’ll be grabbing a snack and heading to the gate soon for the final leg of my flight back to Florida. The Mil-Spec Monkey Adapt Pack has been a welcome companion on this trip. Maybe the Monkey should have called this the Adept Pack, since it certainly is proficient at what it does. TBF recommended! 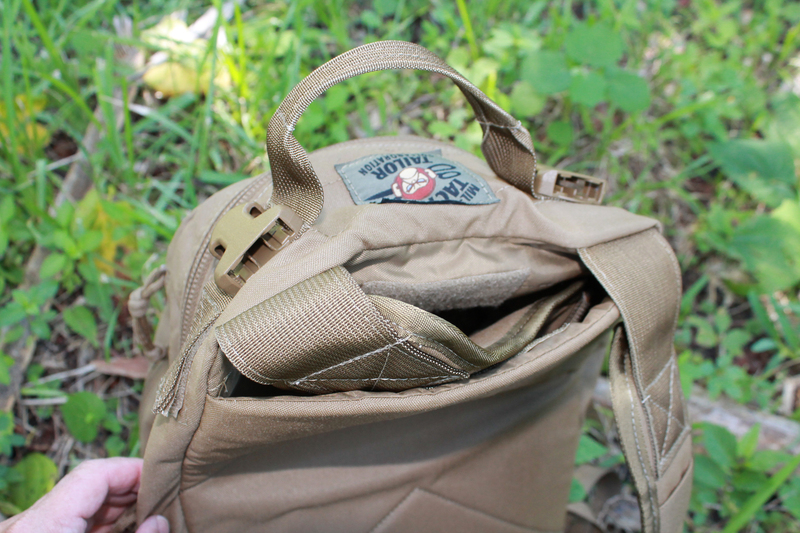 This entry was posted in Concealed Carry, Tactical Bags and tagged Mil-Spec Monkey, Tactical Tailor. Bookmark the permalink. Love the pack very versatile!!!! !